Tipard DVD Creator specializes in creating DVD with any videos like MP4, AVI, MKV, MOV, WMV, TS, etc. Besides, this software can also help you set the unique DVD by adding audio track, background music, picture and opening film to your DVD movie, and selecting one most suitable frame, button, and text to your video. Moreover, it can add effect, trim the length, alter the crop area and add watermark for the video in the process creating DVD. This best DVD Maker is compatible with windows 10. This DVD Burner enables you to create DVD disc, DVD Folder and ISO file with various videos format including MP4, AVI, MKV, MOV, WMV, TS and so on. Thus, you can burn DVD disc, and enjoy the high-quality DVD in your DVD player. With this DVD Maker software, you can choose your needed menu from six kinds of menu templates such as scenery, festival, animal, city, plant and other. Besides, you can choose other templates like frame, button and text. Meanwhile, you can add audio track, background music, picture and opening film to your DVD as you like. Tipard DVD Burning owns multiple editing function effect, such as trim, crop and add watermark. You can change the brightness, saturation, volume, contrast and hue to edit your DVD. Meanwhile, you can trim the length, alter the crop area and add watermark for the video. 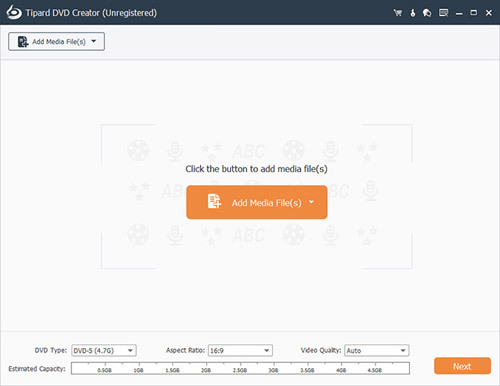 This DVD Creator software makes you to click audio track/subtitle to alter audio track settings including volume, latency, encoder, bitrates and channels. You can also add subtitle and alter subtitle settings when it is necessary, which include language, position, delay, font name, font size and color. 1. Update the kernel to enhance the efficiency. 2. Optimize some parameters to improve user experience. 3. Fix minor bugs.